Using a slow cooker, place trimmed chicken breast in bowl. Figure 1/2 chicken breast per person with no leftovers or a bit more. Top off with 1 cup of chicken broth. I don't have measurements on spices for you as the degree of spiciness will vary per person and household. Sprinkle chicken and broth with chili powder, cayenne pepper, pepper garlic salt and paprika. Cook on low for 3-4 hours. At the 4 hour mark, remove lid and shred chicken. Sprinkle again with chili powder, cayenne pepper and paprika. Return lid and continue cooking on low for an additional 2 hours. At the 2 hour mark sprinkle with the same 3 items again. Cover and cook for an additional hour on low, remove lid and sprinkle again. Cook for one final hour on low. You should cook the meat for a total of 7-8 hours on low. You can use this meat in a traditional way in shells, salad, bowl, wrap or continue reading to learn how to make taco bites. Mmm mmm so good and so glad I tried them. They're a perfect party appetizer, game or movie food. Quick, easy and fun just as tacos should be, but in a mini portion. Preheat oven to 350F°. Let wonton wrappers warm up to room temperature. Cold wrappers break easily, so it's best to remove them from the fridge while you are cooking your meat. This will give them ample time to warm up. Spray a mini muffin pan with oil. Place one wonton wrapper in each muffin cup. Form the wrappers into such a way that they will make a cup or at the very least the corners won't collapse in. When your entire pan is lined with wrappers, spray again with oil. Bake for 7-10 minutes or until golden and crisp. While your wrappers are baking, shred lettuce, dice jalapeno slices and tomatoes. Divide all ingredients into separate bowls. I would have topped off a portion of the taco bites with tomatoes but we didn't have any. Discard any wonton cups that have fallen in and appear to not be useful as a cup, leaving the remainder in the muffin pan. 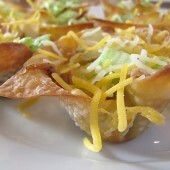 Carefully fill wonton cups with meat and cheese. Pop back in the oven for an additional 5 minutes. Top off with lettuce, jalapenos, tomatoes, sour cream and additional cheese if desired.